Update: Please read the update at the bottom of the story. Earlier this week, News.com broke a story of yet another Apple employee losing an iPhone prototype in a bar (stop me if you've heard this one before...). Unlike the last one, this one (as far as we know) did not get sold to some tech website for a few thousand dollars. However, reports are emerging that raise some serious questions about how Apple went about trying to retrieve the phone. A man in San Francisco, Sergio Calderon, claims that six people showed up at his door claiming to be San Francisco Police Department officers, and that they had badges. They claimed they were looking for a lost phone, but didn't say it was a prototype. The original News.com report had said that police together with Apple investigators went to the guy's house -- but the SFPD says they have no record of SFPD being involved in any such action (which it should have if they were involved). The guy whose house was searched says that no one identified themselves as being from Apple. They also threatened him and his family over their immigration status (even though he says they're all legal). Either way, he was nervous and let them search his house (a mistake) and even check out his computer. They didn't find anything. 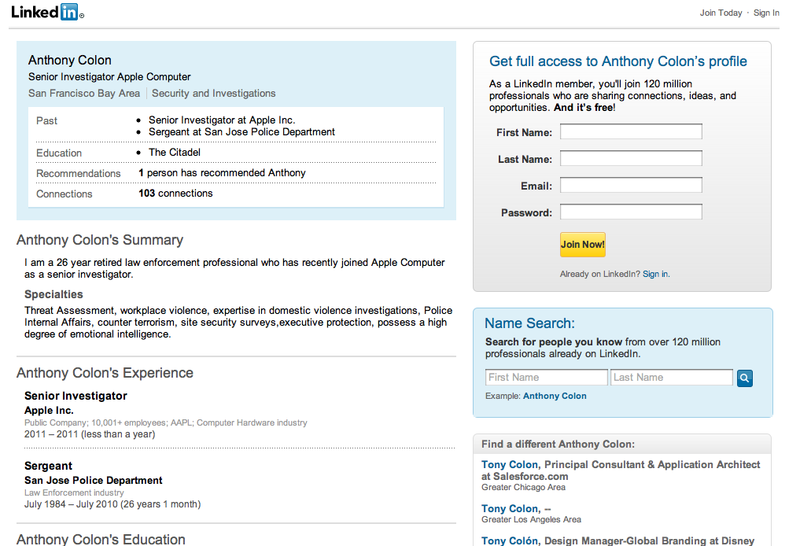 The guy who was "leading" the search gave Calderon his phone number, and that number apparently belonged to Anthony Colon, a former San Jose police sergeant, who recently went to work for Apple. After the SF Weekly story about this came out, Colon suddenly deleted his LinkedIn page, but lots of folks have screenshots. The SFPD is apparently concerned about this, and says that if Calderon comes to them, they'll investigate whether or not Apple impersonated SFPD officers, which is a crime that is punishable with up to a year in jail. If the claims of Calderon prove true, this could become a pretty big headache for Apple, perhaps bigger than merely having an employee lose a prototype. Update: Well this is getting weirder. The same SF Police spokesperson who earlier denied SFPD presence now says that the SFPD did, in fact, "assist" Apple with its internal investigation. Contradicting past statements that no records exist of police involvement in the search for the lost prototype, San Francisco Police Department spokesman Lt. Troy Dangerfield now tells SF Weekly that "three or four" SFPD officers accompanied two Apple security officials in an unusual search of a Bernal Heights man's home. Dangerfield says that, after conferring with Apple and the captain of the Ingleside police station, he has learned that plainclothes SFPD officers went with private Apple detectives to the home of Sergio Calderon, a 22-year-old resident of Bernal Heights. According to Dangerfield, the officers "did not go inside the house," but stood outside while the Apple employees scoured Calderon's home, car, and computer files for any trace of the lost iPhone 5. The phone was not found, and Calderon denies that he ever possessed it. Of course, this raises other questions about the proper role of the police. If it was a police investigation, then police should have done the search. If it was a private search, then the police should not have been present implying that it was a police search. The latest details certainly makes it sound like these police freelanced, suggested to Calderon that this was a police operation... and then never filed the proper paperwork about the whole thing.